There were many scents that have come and gone away with the rain, but after Monsoon’s arrival, a particular one came home with Michael consecutively. 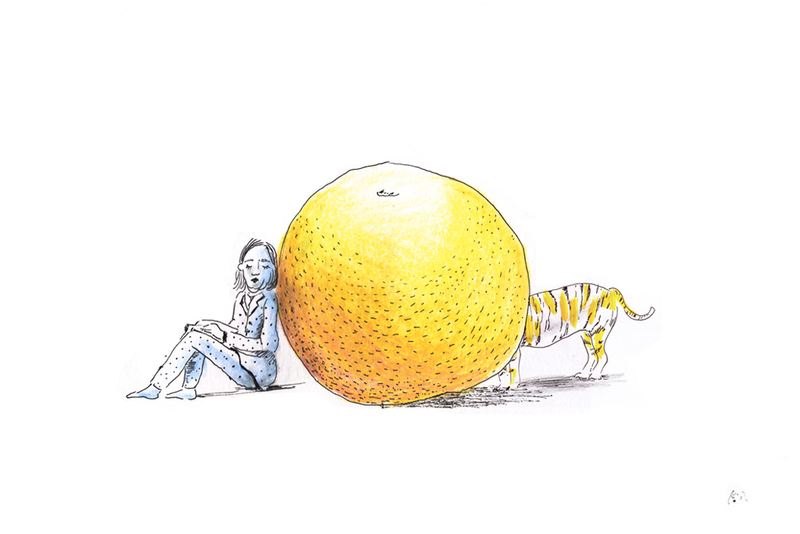 At 2:35 every night, the apartment is heavy with the scent of citrus; although I knew it wasn’t citrus he had, but the girl from the next block that smelled like citrus that lingered hours after she shook your hand. I fell asleep by Monsoon, my index finger still stuck between the pages of the book I would be reading to him, until Michael would crack open the bathroom door. These moments had meant everything to me. That he would spend hours with other girls didn’t matter, for the rain always washed every scent away, and I was the one who would dry him in bed. This time, the rain didn’t do what it usually would. Michael knocked and whispered “Are you home?” as if I had anywhere else to be. I could hear him leaning his head on the bathroom door exhaustively. Outside I could hear Michael muttering, “Don’t cry, please don’t cry.” I don’t say anything and I come in the bathtub where I sink into Monsoon’s fur and eventually into tears. Michael came in and squinted, searching for the formless figure that Monsoon and I have seemed to mold into. The only light visible came from the bedroom, touching little parts of the room, before finally leaving at the sight of dissension. “Do you think maybe you can move the tiger so I can take a bath?” Michael whispered. “Monsoon.” I say, “It’s Michael’s turn.” I shook Monsoon slowly. Monsoon stirred in the darkness and licked my face affectionately. I tried to pull him up, but he was a grown tiger with claws and I was a girl with scars. “I haven’t been very firm with you, but now I have to and I’m sorry.” I whispered into his ear, hidden deep beneath his fur. I guided Monsoon by the bathroom door, where he lied down on the tile, and seemed to continue the deep slumber he was interrupted from. Then, returning to Michael, I did what the rain had failed to do. I undressed Michael mercifully until he was bare except for the light that had decided to rest upon him. I cleaned the strands of Monsoon’s fur and nettles, migrating towards the bathtub sink in a slow and timely manner, then filled it with warm water. While Michael soaked himself, I washed him, cleaning off what was left of the citrus scents he’d collected on his neck, behind his ear, on the tips of his fingers. As I did every night, I dried him off, looking at the world through the crevices of his body and never being quite enough for it. As he did every night, he left, stepping on the books scattered all over the tile floor, and slipped into bed as quietly as he had left it in the morning.